Glow in the dark powder is a fantastic medium to experiment with. 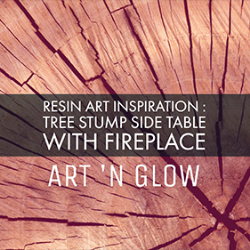 Filling wood crevices with glow powder and epoxy resin adds value and brings a mesmerizing aspect to wood art. On this page, we will be teaching you the need-to-knows on how to pour your first glow in the dark masterpiece. Continue scrolling to see images, videos, and even download our free resin and glow powder guides! 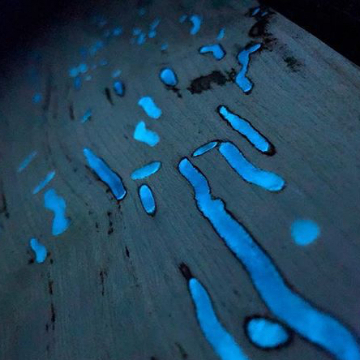 When preparing for a glow in the dark wood pour, the first step is to find a table top or piece of burl wood to experiment with. 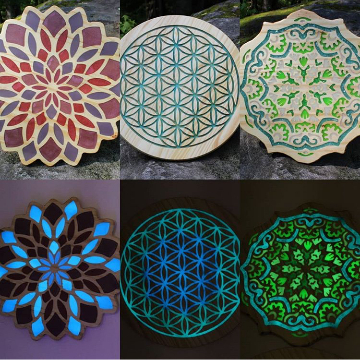 You can create a glowing river table, fill a Lichtenberg design, or experiment with creating your own custom glowing guitar top. 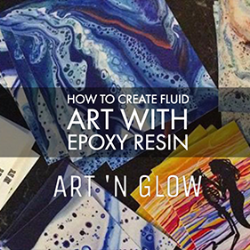 When creating with glow powder and resin, make sure to use the perfect ratio of glow powder to resin. 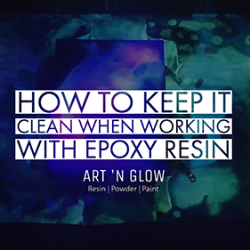 Start by mixing 7 grams of epoxy resin to every one ounce of glow powder to achieve the brightest glow. 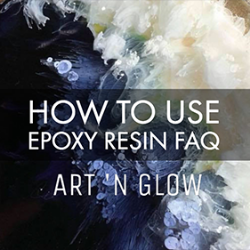 Now that you know all about the perfect ratio of glow powder to resin, scroll down to watch a glow table tutorial and to download our free glow powder guides! 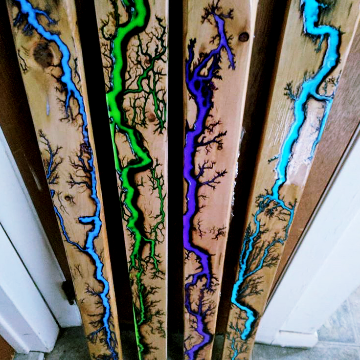 Creating your own glow in the dark wood art is a project away. The fantastic glowing wood art in the images above were created with our glow powder. If you want to create a similar piece, try our fluorescent and neutral glow in the dark powders! Place a drop cloth underneath table or work area, and verify that the table is level. 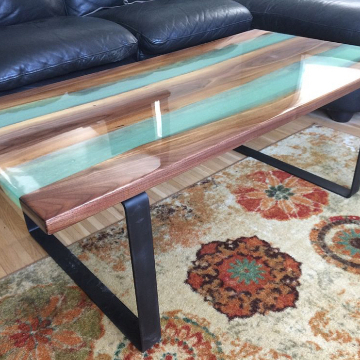 Wipe the table top off with a damp rag and allow it to dry completely (make sure no water or moisture is on the table before pouring resin because water will prevent the resin from curing). 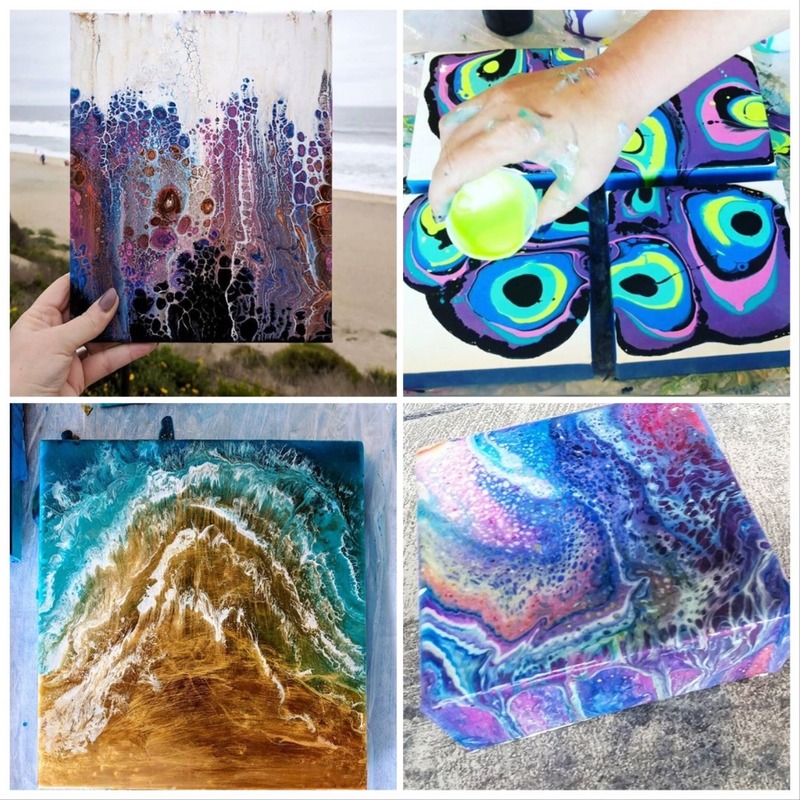 It is recommended to seal porous surfaces such as wood with a thin coating of resin mixed 1:1 (1 part hardener + 1 part resin) by using a squeegee or foam brush prior to doing the main pour (this is to prevent air from the wood getting into your main pour). Let the thin layer cure for 6 hours. If the top doesn't have a raised rim of its own, create a barrier of masking tape or painter's tape around the edges of the tabletop. Press the tape in place around the entire table top with the tape sticking up at least half an inch. Affix objects you wish to encase in the resin to the surface of the tabletop with a hot glue gun (for larger objects like bottle caps, coins, or stones) or a glue stick (for thin items like pictures or newspaper clippings.) Remove any remaining air from underneath the thin items by rolling them with a bottle, or something similar, while the glue is still wet. Mix enough resin to create a thin coating at a maximum thickness of 1/4” (use the chart below as a guide). If you need to pour several layers for additional thickness, let each layer cure for 6 hours prior to pouring the next coat. Note: Larger pours may require mixing for 5-6 minutes and it is recommended to not mix more than 1 gallon at a time. Subsequent coats beyond 48 hours will require a light sanding with 220 grit sandpaper. After sanding, wipe down the surface with a solvent such as denatured alcohol or acetone. Pour a thin layer of the resin mixture onto the top, pouring it slowly and in a thin stream onto the center. 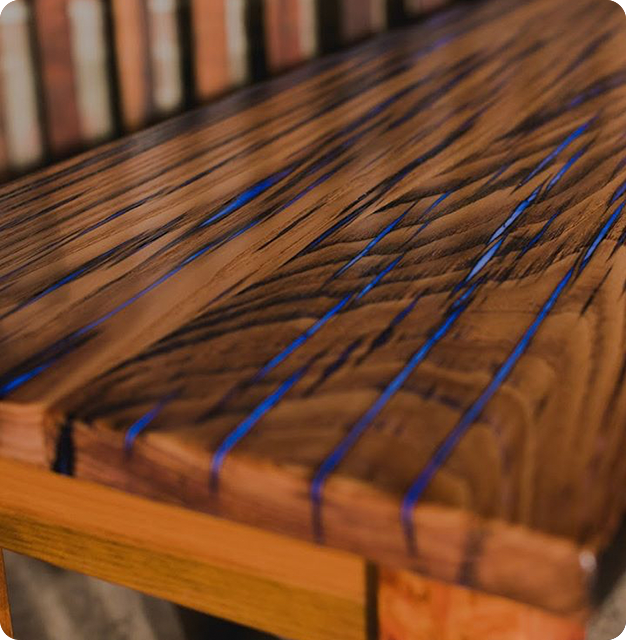 Fill any indents or flaws in the table’s surface with the mixture by using a foam brush to guide the resin into these indentations. 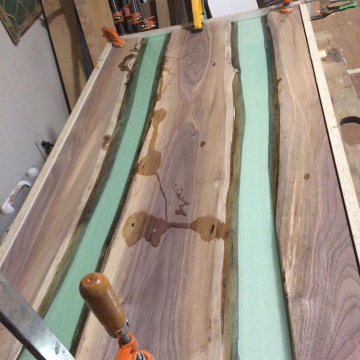 Continue pouring until the entire table top is coated. Allow the first coat to cure for 6 hours before making a second pour. Remove the tape rim from the perimeter of the table top and create a fresh masking tape rim around the table top. Mix a fresh batch of resin, making a slightly larger batch than before. Pour the resin mixture slowly onto the table top until the entire top is coated. Apply additional coats as desired, allowing adequate curing time between coats and using a fresh rim of tape each time. After applying the final coat, allow the table to cure for 24 hours. 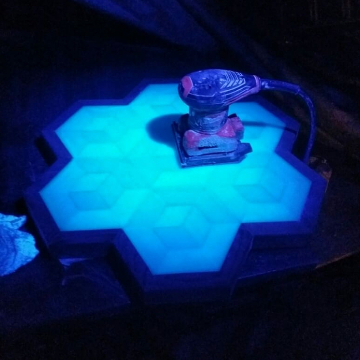 You can spray your cured epoxy table with a UV resistant acrylic for added protection against the outdoor elements, though all epoxy resin will eventually yellow after prolonged UV exposure. We recommended you allow the table top to cure and harden for 5 days before placing objects on it. This purple is fantastic! It has a nice light purple color when mixed in resin, and when you turn off the lights boy does it glow!!! 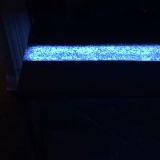 It is almost a bright blue for the first few minutes, but as the glow "Mellows" it changes to a violet blue that is akin to the color of a black light. Yes, it doesn't glow as long or as bright as some of the other colors, but it still glows a good deal of time, and is lovely.As a business owner, this color has caught the attention of lots of folks. Where it is an "unusual" color for a glow, and purple is a favorite color for many, it is well worth the money spent. This resin is great !! It's not to thick or to thin. The resin dares to a crystal clear and about 40 to 45 min. Working time !! 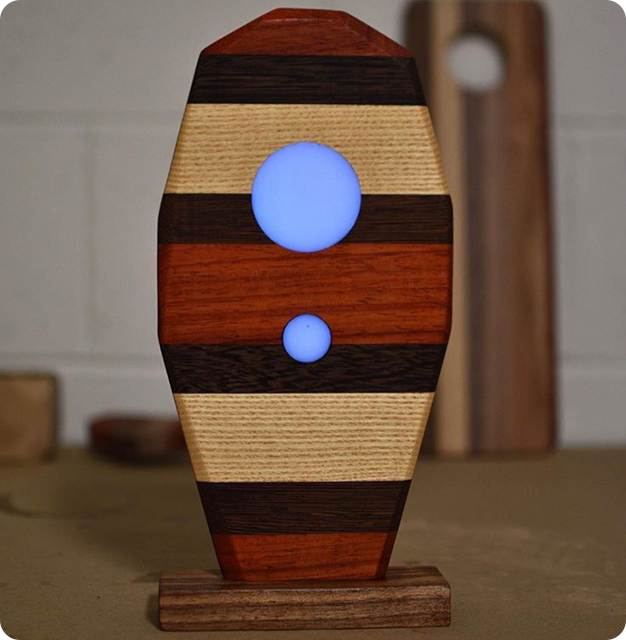 Glow powder adds a mesmerizing effect to woodworking. If you are excited to create your own glow piece, give our glow powder a try! Pearlescent pigments will bring a brilliant, multi-toned, reflective nature to your pour. Experiment with pearl powders to add a marbled, metallic finish to your next masterpiece! We offer Fluorescent Glow Powder and Neutral Glow Powder. The Fluorescent Glow Powder is colorful during the day and glows at night. The Neutral Glow Powder is clear during the day and glows at night. 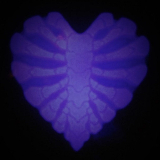 Use a UV black light or use the sun to charge your glow in the dark piece made with glow powder! Once charged, the glow powder will glow bright and slowly dim over the next 6 to 10 hours.